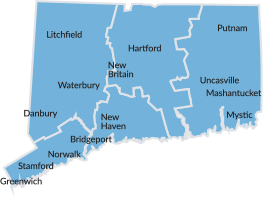 When visiting the Connecticut Office of Tourism's (COT) CTvisit.com site to browse, read pages and/or download information, COT automatically collects and stores the following information, which is used to evaluate the site's efficiency in serving its users. If you voluntarily provide an e-mail address while on the site using our E-Newsletter self-subscribe service, you will receive periodic Connecticut Tourism E-Newsletter updates, unless you elect to opt out. E-mail addresses provided through our e-mail self-subscribe service will not be shared with other businesses outside of COT. Each issue of our E-Newsletter includes directions on how you can unsubscribe if you wish to do so. Information voluntarily entered through our Connecticut Getaway Guide Online Order Form may be provided to other Connecticut tourism organizations and businesses on a selected basis, unless you indicate that you do not wish to receive our E-Newsletter. The user's contact information is also used to contact the user when necessary for surveys or contest entries.